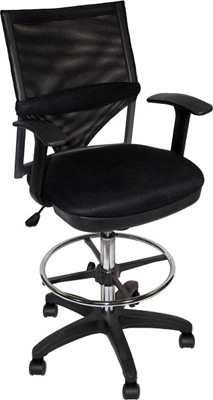 The Martin Universal Design Comfort Mesh Drafting Chair is a Drafting Height Executive Chair with large 5 star safety base and adjustable height armrests. Features include Double hooded multi-surface and large molded foam seat, adjustable Lumbar support band and chrome adjustable 18" foot ring. Airlift height adjustment between 26-35" in height.